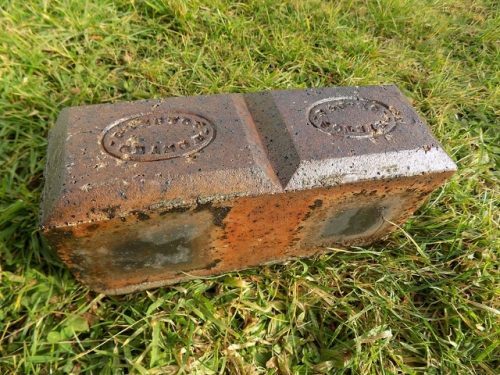 Salt Glazed paver or byre brick. 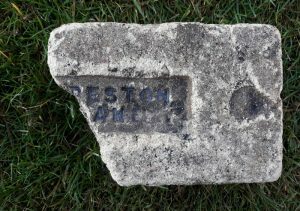 This is half of a paver – seen below for the complete article. 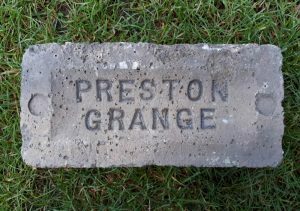 Prestongrange Brick, Tile and Fireclay Works, Prestonpans, East Lothian. 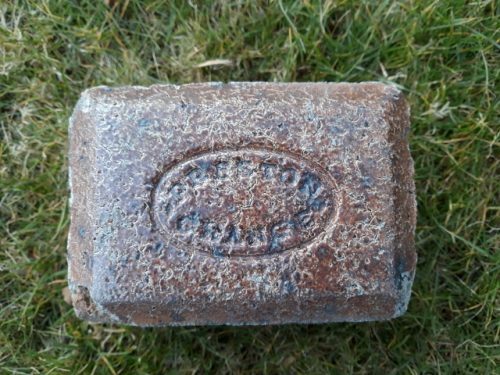 Below – This was found near Cockenzie and is in the possession of Ian Suddaby. Found at Preston Pans, East Lothian. 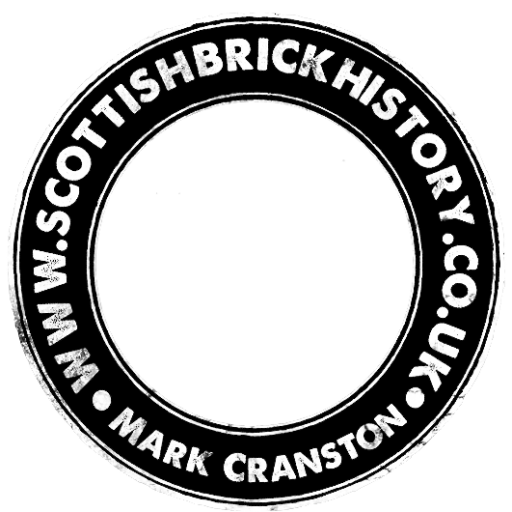 Prestongrange Brick, Tile and Fireclay Works, Prestonpans, East Lothian. A much narrower frog than my other examples. . . .
Found by Tucker Kennedy in the Ayrshire. 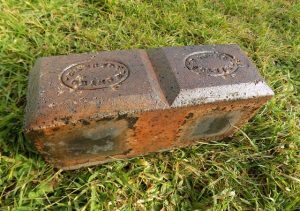 This is a paver or byre block and it is salt glazed. Bourtreehill Fireclay Works, Dreghorn, Ayrshire. . . . .
Found in teh Edinburgh area. 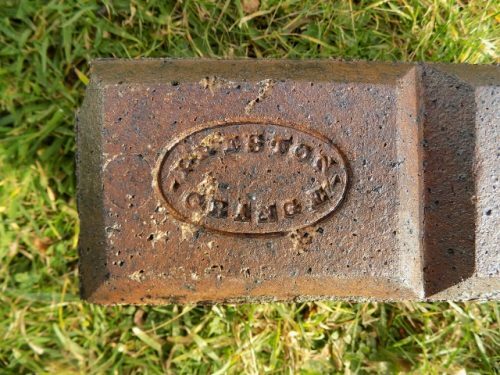 Prestongrange Brick, Tile and Fireclay Works, Prestonpans, East Lothian. . . . .
Found by Ian Suddaby in the Edinburgh area. Salt Glazed paver or byre brick. The paver appears to be double stamped. 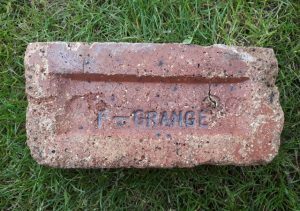 Prestongrange Brick, Tile and Fireclay Works, Prestonpans, East Lothian. . . .
Preston Grange brick found in Gdansk, Poland. This brick was found in on the shore at Gdansk, Poland by Wojtek Kulik. 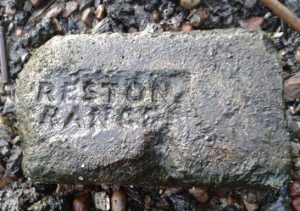 Prestongrange Brick, Tile and Fireclay Works, Prestonpans, East Lothian . . . .
Found by Eddie McLean in the Glasgow area. 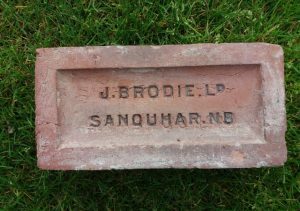 Sanquhar Brick and Tile Works, Sanquhar, Dumfriesshire.. The brick has the same stamp to both sides. 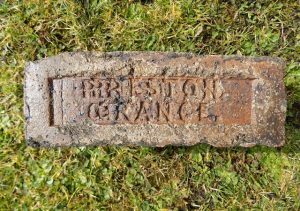 . . . . Below – The same stamp on a salt glazed paver or byre brick. Found in Ayrshire by John (Ian) Jones, Ayrshire. .